Among Argentine revolutionary Che Guevara's possessions the day of his capture was a green notebook filled with poetry. This notebook, guarded by the Bolivian military, eventually went missing, and a photocopy landed in the hands of Mexican writer, Taibo. 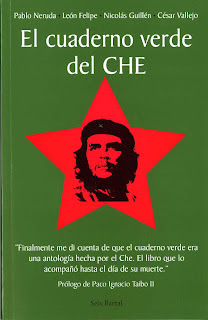 Familiar with Guevara's handwriting from authoring his biography Ernesto Guevara, también conocido como el Che, (Ernesto Guevara: Also Known as Che, Planeta, 1996), Taibo authenticated the poems. Without titles or authors' names, they were at first thought to be Che's poetry. However, further scrutiny revealed that the notebook was a personal anthology, of Che's design, with 69 poems by contemporaries Pablo Neruda, León Felipe, and Nicolás Guillén as well as César Vallejo.